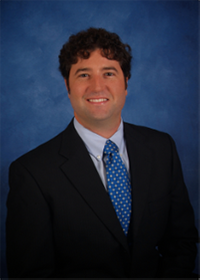 Dr. Grayson Moore is a board certified orthopedic surgeon who was born in El Paso, Texas, where his parents were completing their medical residencies. They later moved to Austin, where he was raised on Barton Creek with three younger brothers. Dr. Moore knew from a young age that he wanted to pursue a career in medicine after watching both of his parents. With this goal in mind, after graduating from St. Michael’s Academy in Austin, he went on to receive his BA in Biology from the University of Texas at Austin. While there, he helped conduct studies on total joint orthopedic prosthetics for FDA approval. He earned his MD from the University of Texas Health Science Center at San Antonio. After completing his MD, he moved to Galveston to complete a residency in orthopedic surgery at the University of Texas Medical Branch. While there, Dr. Moore rotated through the world-renowned MD Anderson Cancer Center and Texas Orthopedic Hospital in Houston, learning various complex joint reconstruction techniques. His research on total joint infections has been presented at multiple conferences and was published in Current Orthopaedic Practice, winning Best Resident Research Award and the Lockhart Award at UTMB for best resident research. Because of his passion for patient care, he has also volunteered with Operation Rainbow in Central America, performing free orthopedic surgery for indigent children and young adults who do not have access to related medical procedures or equipment. Dr. Moore loves serving the community where he grew up. He is currently a member of the Justin Sports Medicine Team, taking care of injured cowboys and rodeo participants. He also works with local high school teams to treat their medical needs. He has previously coached Little League baseball and looks forward to continue coaching as his children grow up. Dr. Moore is not only passionate about patient care, but his family as well. He is married to his high school sweetheart Paige, and has three amazing children, Parker, Cassidy, and Emerson. A former athlete, he loves being active and going on adventures with his family. His favorite pastimes include hunting, camping, scuba diving, boating, writing music and playing guitar. Dr Moore traveled to Honduras to perform mission work ​with this nonprofit organization dedicated to performing free orthopedic surgery for indigent children and young adults in developing countries worldwide who do not have access to related medical procedures or equipment. Learn about Operation Rainbow Click here!